There is more than one way to make Yorkshire Puddings. 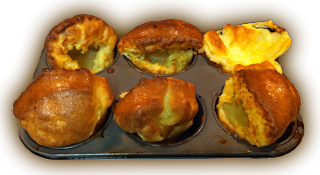 Last week I published a traditional recipe for the kind of Yorkshire Pudding I ate as a child - heavy and filling. Nowadays, many people prefer their Yorkshires to be light and fluffy so I made them that way this week. Here is how I did it. These Yorkshire Puddings are much lighter than the ones we made last week but I wouldn't call them traditional. These are the kind you are likely to be served in a restaurant rather than at your grandmother's table. I could eat several of these light puddings before feeling full. Which kind do you prefer? By the way, leftover light Yorkshires make an excellent breakfast too. Warm them a little and spread with marmalade or jam - delicious!